WASHINGTON — For the first time ever, the leader of Tibetan Buddhism opened the United States Senate with ‘prayer’ on Thursday, wishing for world peace and ‘good fortune’ for America’s lawmakers. 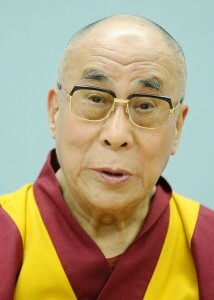 “So pray to Buddha and all other gods,” he said, before speaking in Tibetan and then repeating his “prayer” in English. Senators bowed their heads and visitors watched from the balcony. He then referenced what he called his “favorite prayer,” which he said he offered daily. “As long as space remains, and as long as sentient beings remain, until then may I too remain, and help dispel the misery of the world,” it read. The Senate is customarily opened by prayers from Chaplain Barry Black, a Seventh-Day Adventist, but reports state that Black invites speakers of other faiths at times to present the invocation. Senate Majority Leader Harry Reid praised the Dalai Lama following his presentation, calling for a brief recess so that Senators could greet the Buddhist leader. “The Dalai Lama is well-known throughout the world as a spiritual leader of the Tibetan people and for spreading the gospel of peace and compassion and love of our fellow human beings,” he said. Later in the day, leaders of the House of Representatives, namely Speaker John Boehner and Minority Leader Nancy Pelosi met with the Dalai Lama, who recalled their past encounters with the 79-year-old Tibetan figure. “He said, ‘Nancy, we must rid you of your negative energy,’” Pelosi said, as Boehner chuckled, according to the Washington Post. Barack Obama likewise met with the Dalai Lama late last month although Chinese leaders warned that meetings with the Tibetan leader could “seriously damage” the nation’s relations with China.